Reports of a magnitude 4.8 earthquake hitting Yellowstone National Park in Wyoming on Sunday are coming out, but there have been no reports of damage at this time. That size is the biggest earthquake that has hit the park Feb. 22, 1980. The quake ended up not only rattling the park but also the few observers that were close to one of the most dangerous supervolcanoes in the entire world. Peter Cervelli, who is a spokesperson for the United States Geological Survey’s Yellowstone Volcano Observatory, stated that the earthquake, which reportedly rocked the area around 6:34 a.m. local time, was centered almost in the very middle of Yellowstone National Park, near the Norris Basin. He explained that if there was any destruction from the quake then it would be minor. He added that there had not been many visitors inside the park at that early time. Cervelli also declared that any movement from the earthquake was not expected to cause any volcanic action. 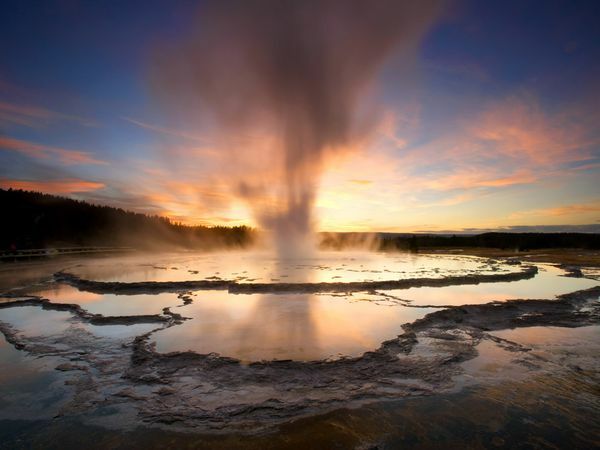 Jessica Turner, who works as a geophysicist with the United States Geological Service, also explained that the earthquake was the strongest to rock Yellowstone since 1980. She said that the citizens in the town of West Yellowstone also felt the shaking of the quake. University of Utah Seismograph Stations reported that their instruments also showed the quake occurring about 6:34 a.m. MDT, and they agreed that the epicenter was approximately four miles to the north-northwest of the Norris Basin in the park. That is about 90 miles northeast of the town of Rexburg, Wyoming or 111 miles northeast of Ammon, Wyoming. This latest earthquake is only the strongest one of almost 30 earthquakes that has struck in the Yellowstone area in the past few days and struck close to the Montana-Wyoming border. Late in 2013, a science study into the supervolcano discovered that magma in an underground chamber was nearly three times bigger than formerly was believed, with the cave capable of holding many tons of liquefied rock. They felt this amount of magma could lead to more earthquakes happening in the region. However if the volcano was to ever erupt, it is believed that the outpouring of smoke, lava and ash would most likely destroy the entire United States and end up affecting the entire rest of the world. At the same time in California, experts are saying that a big earthquake occurring along the less known Puente Hills fault that ended up giving that state a moderate shake last week might end up doing more damage to the area than the long feared and talked about “Big One” that has been anticipated from the more well-known San Andreas Fault..
Part of the problem comes from the possible damage that would come from the fault because it runs so close to numerous susceptible older buildings. Many of them were built with concrete, in the Los Angeles area. The fault was found in 1999 and would likely be felt over a large area.